The ability to interact with users is one of the great lures of the Internet for businesses and individuals. Most of you have filled out a form on the Internet, then hit the submit button to send your data off into cyberspace. How is it done? Most books give the old "setting up the cgi script is beyond the scope of this book" line, and this evasion has long been a frustration to many Web designers. I hope that this article helps you set up a feedback form that uses the wonderful free cgi script FormMail offered for download at Matt's Script Archive. Be sure to get the latest version, 1.91, as it addresses some security issues. Download the script from the following URL: http://www.scriptarchive.com/formmail.html. This tutorial covers most of the different types of form objects you will use when creating interfaces for interacting with users. While Adobe GoLive is used for purposes of example, this lesson can easily be adapted to any other visual HTML authoring tool such as Dreamweaver or Claris Home Page. The spinach eaters among us can even go ahead and hand code the form objects. 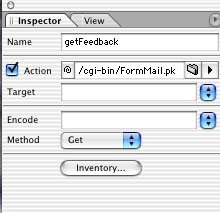 Whatever your tool, what we are going to do is create a simple user feedback form and connect it to a CGI (Common Gateway Interface) script that will return the data to your E-mail box. First we will set up the form before we configure the script. Have your forms icon selected in your GoLive Objects panel. Drag a form onto the page. Enter your settings as follows. Select POST as the method. Put down the path to your cgi script as the action. On your web server you will most likely save your cgi script to a cgi-bin folder. The path would look like this: /cgi-bin/FormMail.pl (the pl stands for Perl, which is the most common scripting language used in CGI scripts.) You might also want to put the absolute (or full) path of your domain name. Mine is http://www.swanilda.com/cgi-bin/FormMail.pl Give your form a name. Next to the cell that contains the label "Name" drag a text field form object to the cell on the right. I name it "name" because the cgi script will then return the data to me as "name = Person's Name." I can add a default value to appear in the field to make the form more accessible to people with disabilities. I made visible 35 so that there is room for longer names. Now add another text field next to the cell that says email. I named it email and entered a value Enter your email address here." I again set visibility 35 to lengthen the text field so that it accommodates longer E-mail addresses. Next to Comments, drag a text area form object. Give it a name. This is like a text field, except that you have more room available for longer areas of text. Rows and columns allow you to designate the amount of space you want to show on the page. Now let's add some radio buttons for the question "Do you like this tutorial?" The key to radio buttons is to give all the radio buttons in the group the same name. That way, the user can select only one choice. I dragged two radio buttons next to the question. I named them both "likeTut" and gave one a value of yes, and the other a value of no. The last form object we will use is the checkbox. Drag a checkbox object next to the newsletter request. Give it the name "newsletter" and a value of yes. You can also choose the "Select" box if you want the checkbox to have a check in it by default. Drag a submit button (second form object in the form objects panel) to the page. If you select the label checkbox, you can change the default name "Submit" to something more meaningful. You can drag a reset button (third form object in the form object panel) to the page so that users can clear the form and start over if they like. We're not done yet, however. We need to add at least one hidden field, so drag a hidden form object somewhere on the page within the parent form object. We need to indicate where the form data gets sent! Usually this is done with a hidden field you name "recipient" whose value you'll set to your E-mail address. There are other hidden fields you might want to consider adding to your form. If you want the E-mail you receive with the form data to have a subject when it comes to your E-mail box (rather than an empty subject field), add a hidden field named "subject" and create a meaningful subject name. If you want to create a custom page to which the user is directed after he or she successfully submits the form data, you can use the hidden field named "redirect" and enter the URL for the page. Now that the form is all set up, it is time to make sure the script is configured for your server, and has the proper permissions set. First make a backup copy of the script in case you don't quite get it right the first time. This is not to mean that it is complicated -- it is extremely simple. Of course, it always is when you know how, right? Open Matt's FormMail script in your favorite text editor. On the Mac the editor of choice is BBEdit Pro. It is nice because it color codes values and otherwise flags certain parts of the code for you. You can download BBEdit Lite for free, though, and it will do the job as well. If your editor does not color code, you'll just have to scrutinize the text a little bit to find what you are looking for. It is two lines close to the beginning of the script, so don't worry. At the top of the script you'll see text surrounded by a box created from # signs. You want to find the part of the script that sets the referers and recipients allowed from your Web directory. You are looking for the following lines: @referers= () and @recipients= () Where you see my domain, swanilda.com, you want to enter your own values within the parentheses -- your domain or IP address. Be sure to leave the single quotes. Now all you have to do is save and upload the script to your cgi-bin. Next you need to set permissions for the script. The usual permissions for FormMail is chmod 755 to make it executable. Using the Golive ftp client, select your file while connected to the server, and check the boxes for Execute. Now upload your html page to the proper directory, and the script to the cgi-bin. Test your form in the browser. Fill in some data and hit the submit button. The results should arrive in your E-mail! If you had problems, be sure to ask your ISP where the path to your cgi-bin is located...because that, uh, is beyond the scope of this article.